Jump-start your day with a breakfast that's seriously nutritious and seriously delicious. Here are two fantastic choices! 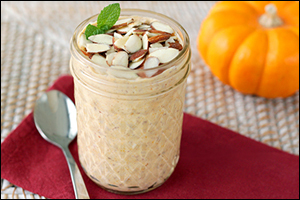 In a medium bowl or jar, combine all ingredients except almonds. Mix thoroughly. Cover and refrigerate for at least 4 hours, or until oats are soft. 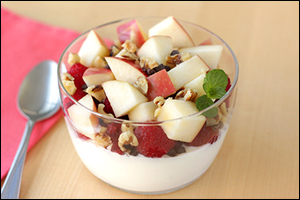 Place yogurt in a medium bowl, and top with remaining ingredients. If you and your pals eat superfoods, will that make you Super Friends? Only one way to find out... Click "Send to a Friend" now!